My name is Karen Kalafat. I began my yoga journey in 2002 after I moved to Colorado. I had been diagnosed with degenerative disc disease and was struggling with lower back pain. I sampled all different kinds of yoga, including Iyengar and Hatha. Yoga was not a magic cure, for I went on to have a herniated disc a few years later that required surgery. The ongoing weakness in my lumbar spine requires that I keep a strong core, or the pain returns. Yoga practice is magical in that it helps me manage these spinal issues, along with life’s other stresses. I moved back to WV in 2011. I decided to enroll in teacher training to deepen my knowledge, and be more able to share my passion for this wonderful practice. 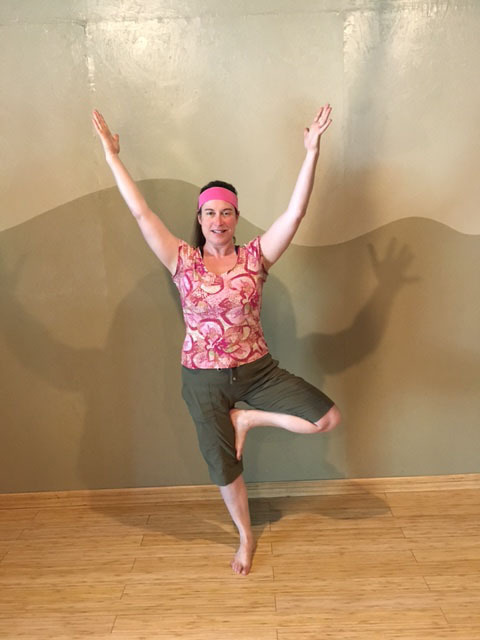 I completed my yoga teacher training in 2015 through Pittsburgh’s 3rd Street Yoga School and Morgantown’s BlissBlissBliss studio. I have a current RYT 200 certification through Yoga Alliance. I have a passion for teaching, the outdoors and our environment, and how to tie it all together with sustainable living. There is nothing quite like a home-grown tomato, and what I can’t grow, I try to buy from local, organic sources. I make a lot of my own home-care and cleaning products using simple non-toxic ingredients and essential oils. I believe that yoga is a wonderful framework within which to pursue a healthy mind, body and soul to allow us to enjoy and appreciate this amazing world we inhabit.